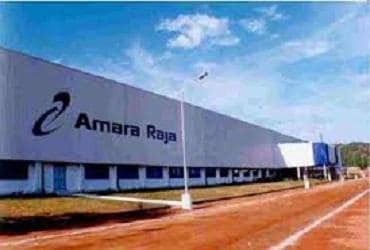 Amara Raja Batteries Ltd (ARBL) is aiming to be a Rs 10,000-crore entity in the next 2-3 years as the Hyderabad-based company clocks a solid double-digit growth in its automotive segment, said a top company official. ARBL expects that its automotive segment will contribute around two-thirds of its overall sales in the next 2-3 years as the vehicle sector grows and the rest will come from the industrial segment, ARBL CEO S Vijayanand told PTI. Besides, the company sees potential in the solar segment, which requires clean batteries for energy storage, as thrust on green energy is on the rise. ARBL's revenue in 2016-17 was Rs 5,981.39 crore. Asked by when ARBL will achieve Rs 10,000-crore sales, Vijayanand said: "Since we are are in two different verticals, a lot depends as how these individual verticals are likely to grow, but if we have our way and able to realise plans which we have in blueprint, we should be getting there in the next 2-3 years timeframe probably." The company is registering a CAGR (compound annual growth rate) of around 14-15 per cent in its revenue over the past five years, he added. "We expect that kind of double-digit growth is still possible for the next 2-3 years," he added. The automotive and industrial segments contribute in the ratio of 60:40 in the ARBL's revenue pie. "Our typical (revenue) historically split between automotive and industrial is 60:40, but if you look at the market potential, it should stabilise to two-thirds to one-third ratio," he said, adding that "it would take a couple of years to reach there". The industrial segment is driven by two large players -- the telecom industry and UPS - and solar has the potential to emerge as the third factor. "Today, solar capacities are being added, which constitute a smaller percentage of the grid, but at some point of time, I am sure that solar component of the overall power generation would be at a powerful point," he said, while adding that a new market would be created by people who would store energy to "avoid peak consumption points" as well. The company is also eyeing development of 100 smart cities by the government that require solar energy solutions and may participate directly if there is a large order. "We would like to be neutral in providing our solutions to most players, but if there is a large project that requires a consortium bidding, we would be open to those project-specific associations," he said. Various ultra mega solar parks are being set up in different states and ARBL has big bidding plans. The company exports 12-15 per cent of its volumes to South-East, South Asia, the Middle-East and some African countries -- in both industrial and automotive segments. "Our focus so far has been pretty much to grow in the domestic market, but going forward in the next 3-5 years, there would be much more focus on export to the identified countries where tariff structure is not a barrier," he said. The overall battery market in India is estimated to be Rs 27,000 crore and dominated by two companies - ARBL and Exide. ARBL is the flagship company of the Amara Raja group, with 26 per cent equity stake each from the Galla family and US-based Johnson Controls Inc.